If Leo Fender had not invented the Stratocaster electric guitar, the Jimmy Hendricks phenomenon would not have happened. This is more than can be said for Russian rock music: Were it not for energetic and daredevil managers right from the outset, there may never have been any rock music in the Soviet Union at all. 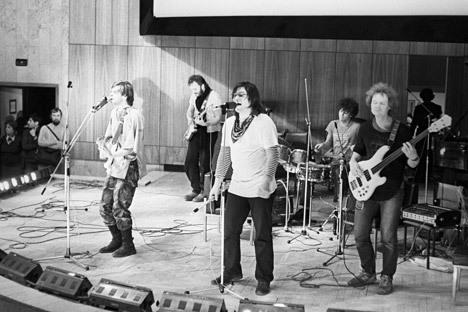 At the height of Brezhnev’s era of stagnation in the 1970s, students at the Moscow Institute of International Relations and the Moscow State Linguistics University began to stage concerts on a commercial basis not seen before. Tickets cost 3-5 rubles each and were nothing more than half-sized postcards with homemade animal stamps on them. There was no entrance fee, dates or addresses shown on the “ticket.” All the information was passed around by word of mouth. Today, it is hard to say who organized the first underground rock music concert in Moscow, but memoirists often mention Yuriy Ayzenshpis (1945-2005). In 1970, he was arrested and even sentenced to 18 years for illegal currency operations. Underground showbiz was a criminal offence in the Soviet Union, along with private enterprise and many other breaches of the law. These included forging documents, preparing and selling illegal tickets, composing uncensored songs, illegal gatherings of people and consuming alcohol in a public place. The punishments for these offenses were very different — from being excluded from university, to a prison sentence. In contrast to those who were motived purely by profit and dealt illegally in antiques, icons, currency and the manufacture of jeans and other goods in short supply, rock managers were dedicated people. They really did love music and they understood it brilliantly. For many young people at that time, rock music was akin to a religion. It was not without reason that the face of John Lennon was reproduced as an icon from the covers of Beatles records. It was for this reason that the system had such a hard time fighting the underground movement: The point being that this was not about criminals or anti-Soviet elements, but about a powerful youth movement, which grew up around alien spiritual values and was orientated toward the West. There were a great many rockers and they possessed excellent skills in self-assembly. A whole underground industry was established in the country in a matter of a few years. Homemade guitars and amplifiers were made for rock bands, and recording studios appeared for underground music, where musicians recorded their own songs. These recordings were distributed on reels of tape around the entire Soviet Union at lightning speed, via a network of “copyists.” All this was later dubbed “Russkiy rok,” or Russian rock. By the end of the 1970s, more than a dozen rock-managers were already operating in Moscow and they had a network of aides to distribute tickets and advertising. One of the most famous “managers” was Tonya Krylova, a student at the Institute of Medicine who became a paramedic. Tonya organized dozens of underground rock concerts in Moscow and its suburbs. Practically all the underground groups in Moscow in the second half of the 1970s played at these concerts—groups such as Mashina Vremeni, Voskresenie, Vysokosnoe Leto, Araks, and Rubinovaya Ataka. I went to one of these concerts as a schoolboy. The 700-seat hall was full to the rafters with students. The atmosphere was unusual in comparison with perfunctory official Soviet Vocal and Instrumental Ensemble (VIA) concerts. There were no posters, no police and no usherettes. Tonya stood at the entrance with some of the guys from her team. On passing through this primitive cordon, the audience was left to its own devices and did whatever they wished. There were, however, no fights and very few drunks—and all unaided! This business was commercially viable, and could return a 3,000–5,000 ruble profit. At the time, that was big money. The risks, however, were enormous: At any moment, the organizers, musicians and even the audience could end up behind bars. These things happened all too often. It was for this very reason that everything was done in the complete absence of any documents, financial reports and agreements, so that there was no evidence. If a criminal investigation was started into an illegal concert, everyone would say unanimously: “No money changed hands, nobody organized it. I just happened to wander into the hall after I heard the sound of a guitar as I walked down the street. Tonya Krylova? No, I have never heard that name.” If people showed solidarity (and they did), the police had no choice but to release all the detainees. The experience in Moscow was adopted in other Russian cities. By the 1980s, underground tours were added to this program. With the advent of perestroika in the second half of the 1980s, everything became much easier: The criminal element in terms of organizing concerts disappeared, and the ban on private enterprise was lifted. The rock business in the Soviet Union began to become more reminiscent of that encountered in the west. Finally, in 1991, the totalitarian system that had limited entrepreneurial activity among Russian citizens for 70 years collapsed. This was encouraged in no small measure by “Russkiy rok” and its underground managers.